Entering Arun's Thai Restaurant for the first time, you are transported to the exotic land of the Thais. The restaurant's beautiful interior reflects the harmonious balance of contemporary simplicity and classical elegance. Cut and patterned panels of deep mahogany and other wood frame walls of vibrant color. Lustrous Thai silks and exquisite classical Thai paintings sparkle and delight. Take a few moments to stroll through this delightful haven. The 2,500 square-foot dining room is designed to provide semi-private alcoves, with lines-of-sight into the full dining area. The elegant main dining room is bordered by a raised gallery along its south wall; from this charming gallery small, intimate tables overlook the main dining room through a series of Thai-style windows. For more than a decade, Arun's has received wide spread recognition and numerous awards. 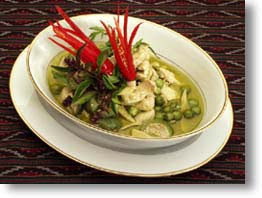 Green curry, the classic curry of Central Thailand and Bangkok, is characterized by its fresh, aromatic flavor and silky smooth texture. Here it is traditionally prepared in a thinner-bodied soupy consistency with chicken and baby eggplants. Since the chilies used in green curry are fresh, not dried, the quality of spiciness is experienced not as a fiery hotness in the throat, but as an immediate, pleasurable tingle on the lips and tongue. The level of spiciness, which depends on the amount of chilies added to the curry paste, can be adjusted according to individual taste. Coriander and cumin add aromatic depth, and coconut milk imparts a creamy natural sweetness and changes the color of the curry to a stunning pale olive green. If available, small, whole cherry eggplants give the finished dish a bejeweled appearance. Reservation : Tuesday, Wednesday, Thursday, and Sunday 5:00 P.M. - 10:00 P.M.